Catholic social teaching is the body of doctrine developed by the Catholic Church on matters of social justice, involving issues of poverty and wealth, economics, social organization and the role of the state. Its foundations are widely considered to have been laid by Pope Leo XIII's 1891 encyclical letter Rerum novarum, which advocated economic distributism and condemned both capitalism and socialism, although its roots can be traced to the writings of Catholic thinkers such as St. Thomas Aquinas and St. Augustine of Hippo, and is also derived from concepts present in the Bible and the cultures of the ancient Near East. According to Pope Benedict XVI, its purpose "is simply to help purify reason and to contribute, here and now, to the acknowledgment and attainment of what is just. ... [The Church] has to play her part through rational argument and she has to reawaken the spiritual energy without which justice ... cannot prevail and prosper", According to Pope John Paul II, its foundation "rests on the threefold cornerstones of human dignity, solidarity and subsidiarity". These concerns echo elements of Jewish law and the prophetic books of the Old Testament, and recall the teachings of Jesus Christ recorded in the New Testament, such as his declaration that "whatever you have done for one of these least brothers of Mine, you have done for Me." Catholic social doctrine has always tried to find an equilibrium between concern for the whole society, especially for the weakest and poorest, and respect for human liberty, including the right to private property. In his second encyclical, Laudato si, the pope lays forth a "biting critique of consumerism and irresponsible development with a plea for swift and unified global action" to combat environmental degradation and climate change. Every commentator has their own list of key principles and documents, and there is no official ‘canon’ of principles or documents. The Church has chosen the concept of "charity in truth" to avoid a degeneration into sentimentality in which love becomes empty. In a culture without truth, there is a fatal risk of losing love. It falls prey to contingent subjective emotions and opinions, the word “love” is abused and distorted, to the point where it comes to mean the opposite. Truth frees charity from the constraints of an emotionalism that deprives it of relational and social content, and of a fideism that deprives it of human and universal breathing-space. In the truth, charity reflects the personal yet public dimension of faith in God and the Bible. As with the principles above, there is no official list of key themes. The United States Conference of Catholic Bishops has identified these seven key themes of Catholic Social Teaching set out here. Other sources identify more or fewer key themes based on their reading of the key documents of the social magisterium. Catholics oppose acts considered attacks and affronts to human life, including abortion, fornication (including contraception), euthanasia, capital punishment, genocide, torture, the direct and intentional targeting of noncombatants in war, and every deliberate taking of innocent human life. In the Second Vatican Council's Pastoral Constitution on the Church in the Modern World, Gaudium et spes (Latin for "Joy and Hope"), it is written that “from the moment of its conception life must be guarded with the greatest care." The Church does not oppose war in all circumstances. The Church's moral theology has generally emphasised just war theory. kind of lawful slaying belongs to the civil authorities, to whom is entrusted power of life and death, by the legal and judicious exercise of which they punish the guilty and protect the innocent. The just use of this power, far from involving the crime of murder, is an act of paramount obedience to this Commandment which prohibits murder. The end of the Commandment is the preservation and security of human life. Now the punishments inflicted by the civil authority, which are the legitimate avengers of crime, naturally tend to this end, since they give security to life by repressing outrage and violence. Hence these words of David: In the morning I put to death all the wicked of the land, that I might cut off all the workers of iniquity from the city of the Lord. A belief in the inherent dignity of the human person also requires that basic human needs are adequately met, including food, health care, shelter, etc. Many see this as a basis for the support of the welfare state and of governmental economic policies that promote equitable distribution of income and access to essential goods and services. According to the Book of Genesis, the Lord God said: "It is not good for the man to be alone". The Catholic Church teaches that man is now not only a sacred but also a social person and that families are the first and most basic units of a society. It advocates a complementarian view of marriage, family life, and religious leadership. Full human development takes place in relationship with others. The family—based on marriage (between a man and a woman)—is the first and fundamental unit of society and is a sanctuary for the creation and nurturing of children. Together families form communities, communities a state and together all across the world each human is part of the human family. How these communities organize themselves politically, economically and socially is thus of the highest importance. Each institution must be judged by how much it enhances, or is a detriment to, the life and dignity of human persons. Several organs of the Holy See are dedicated to social issues. The Pontifical Council for Justice and Peace is tasked with promoting "justice and peace in the world, in the light of the Gospel and of the social teaching of the Church." It works to clarify, expand upon, and develop new teachings in the areas of peace, justice, and human rights. The council also collaborates with local and international Catholic organizations working in those areas, and works with the social welfare organs of the United Nations, through the Secretariat of State. The Pontifical Council Cor Unum is the Holy See's primary organ devoted to charitable works. The council supervises the activities of Caritas International. It also operates the John Paul II Foundation for the Sahel and the Populorum Progressio Foundation. The Pontifical Academy of Social Sciences promotes the study and progress of social sciences. The academy works with various dicasteries, especially the Council for Justice and Peace, to contribute to the development of the Church's social teachings. Christian Democracy, a political movement in numerous European and Latin American countries, is significantly influenced by Catholic social teaching. It has influenced many other political movements in varying degrees throughout the world, including those in non-Catholic nations. The subsidiarity principle which originated in Rerum novarum was established in European Union (EU) law by the Treaty of Maastricht, signed on 7 February 1992 and entered into force on 1 November 1993. The present formulation is contained in Article 5 of the Treaty Establishing the European Community (consolidated version following the Treaty of Nice, which entered into force on 1 February 2003). Progressio Ireland, a nongovernmental development organisation based in Dublin, is also founded on the principles of Catholic Social Teaching. It works to achieve sustainable development the eradication of poverty in the world's underdeveloped nations. The International Movement of Catholic Professionals and Intellectuals, "Pax Romana" (www.icmica-miic.org), is another organization firmly based on Catholic Social Teaching principles. It is active in all continents, particularly Europe, the Americas and Africa. ↑ Enrique Nardoni, translated by Sean Martin (2004). Rise Up, O Judge: A Study of Justice in the Biblical World. Baker Books. 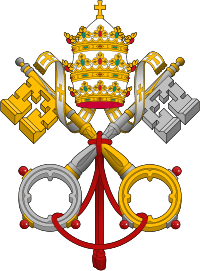 ↑ (Pope Benedict XVI, Deus Caritas Est, 28). ↑ (John Paul II, 1999 Apostolic Exhortation, Ecclesia in America, 55). ↑ Ellen C. Mayock, Domnica Radulescu. Feminist Activism in Academia: Essays on Personal, Political and Professional Change. McFarland. Retrieved 2011-04-08. Catholic institutions are often dependent upon the generosity of benefactors who are politically and religiously conservative, wary of or outright disapproving of feminism. Catholic traditions and current official church stands are at odds with many feminist positions. ↑ Lynne Bravo Rosewater, Lenore E. Walker. A Handbook of Feminist Therapy: Women's Issues in Psychotherapy. Wiley-Blackwell. Retrieved 2011-04-08. Other feminist concerns, such as changes in sexist language, have been an issue for almost a decade in the Roman Catholic Church and most other churches as well. 1 2 S. Adamiak, E. Chojnacka, D. Walczak, Social security in Poland – cultural, historical and economical issues, Copernican Journal of Finance & Accounting, Vol 2, No 2, p. 16. ↑ S. Adamiak, D. Walczak, Catholic social teaching, sustainable development and social solidarism in the context of social security, Copernican Journal of Finance & Accounting, Vol 3, No 1, p. 14. 1 2 3 The Busy Christian's Guide to Social Teaching. ↑ Curran, Charles E. (2002). Catholic Social Teaching, 1891–present: A Historical, Theological, and Ethical Analysis. Georgetown University Press. ISBN 9781589012929. Retrieved 17 January 2014. ↑ Jim Yardley & Laurie Goodstein, Pope Francis, in Sweeping Encyclical, Calls for Swift Action on Climate Change, New York Times (June 18, 2015). ↑ Daniel Schwindt, Catholic Social Teaching: A New Synthesis (Rerum Novarum to Laudato Si), 2015, p. 163. ↑ Daniel Schwindt, Catholic Social Teaching: A New Synthesis (Rerum Novarum to Laudato Si), 2015, p. 164. ↑ Message to the Director General of the Food and Agriculture Organization for the Celebration of World Food Day, October 16, 2006. ↑ For further elaboration, see Pope Leo XIII, Rerum novarum, May 15, 1891, "Archived copy". Archived from the original on 2011-10-20. Retrieved 2011-10-11. documents/hf_l-xiii_enc_15051891_rerum-novarum_en.html,, §48-51 and Quadragesimo anno, §29-39. ↑ Rerum Novarum § 46. ↑ Caritas in veritate § 65. ↑ Rerum Novarum § 22; Quadragesimo Anno § 5; Centesimus annus § 3. ↑ Caritas in veritate § 32, 36, 37, 39, 42, 49. ↑ Evangelium Vitae § 65;, Catechism of the Catholic Church § 2277. 1 2 Catechism of the Catholic Church § 2267. ↑ Forming Consciences for Faithful Citizenship, A Call to Political Responsibility from the Catholic Bishops of the United States, United States Conference of Catholic Bishops. ↑ Sérgio Campos Gonçalves, “Os fundamentos religiosos da pequena propriedade no pensamento católico: uma perspectiva histórica”, Revista Brasileira de História das Religiões, GT História das Religiões e das Religiosidades – Associação Nacional de História, v. 2, pp. 196–206, 2008, ISSN 1983-2850. ↑ Sollicitudo rei socialis § 42. ↑ Deus Caritas Est Archived February 11, 2010, at the Wayback Machine. §22. ↑ "Profile". Pontifical Council for Justice and Peace. Retrieved 2008-03-18. ↑ "History". Pontifical Council Cor Unum. Archived from the original on February 1, 2009. Retrieved 2008-03-18. ↑ "Motu Proprio, History and Aim". Pontifical Academy of Social Sciences. Retrieved 2008-03-18.